I have some great blog friends. I hope in the future to meet these ladies in real life, and be more than just blog friends. Although, I think we are. Right? You all know who you are! And it seems each day blogging I get to know more and more people. One day I hope to even make it to a conference. How fun would that be? I had to turn my phone off recently when all the bloggers were at BlogHer in Seattle. Every tweet and instagram photo was about BlogHer. And the food. But, if I never make it to a conference I know I still have some of the best friends visiting me here on Shugary Sweets. A while back (and I do mean awhile), my friend Jocelyn shared a picture on instagram of Raspberry m&m’s. I was drooling immediately because they reminded me of the cherry m&m’s and this popcorn. I knew I needed some of these, but I couldn’t find them in the stores near me. Not long after my whining, I received a beautiful package. One that included a bag of raspberry m&m’s, and crunchy biscoff (yeah, I whined about that too), and some other fun things. I ripped that bag open immediately and gulped down a big handful of these candies. Oh my they are good. But, before I inhaled all of them I knew I had to make a delicious dessert. And so, the idea for the dark chocolate cake with raspberry cream cheese frosting and dark chocolate ganache was created. Quite a title for a cake, but you can’t leave anything out! Funny thing though, Jocelyn who sent me the candy, also made something very similar. In cupcake form! And guess what? My Target now carries these candies, it’s quite exciting. I still can’t find the crunchy Biscoff, but at the rate I consume Biscoff it’s probably a good thing. Want more m&m recipe ideas? Check out these great posts…. Pour cake batter into two prepared pans (2-9inch round cake pans, lined with parchment paper and greased and floured). Bake in a 350 degree oven for about 25 minutes. Remove and allow to cool about 10 minutes before removing from pans. Cool completely before frosting. **I use Wilton bake strips to bake my cakes evenly with no domed tops. Works every time! In large mixing bowl, beat butter and cream cheese until smooth, about 1 minute. Beat in vanilla paste, milk and powdered sugar. Continue to beat for about 3-5 minutes, until fluffy. Add raspberry and beat for about 1 minute, until combined. In saucepan on low heat, whisk dark chocolate and heavy cream together until smooth and melted. Remove from heat. To assemble, lay one layer of cake on cake plate (I use parchment paper strips under cake to keep plate clean). Spread frosting on top of cake. Add second layer of cake. Frost sides of cake, then frost top of cake. Pour slightly cooled ganache over top of cake and decorate with raspberry m&m candies. 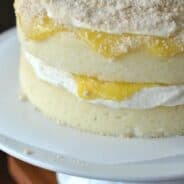 Store cake in refrigerator and enjoy. Blog friends are the best! I can’t wait until we get together this summer…it is going to be a blast!!! And I say you and me…conference for sure!!! I love the combination of chocolate & raspberry. Sounds like a good thing to bake tonight! This looks delicious! Thanks for stopping by and leaving a note! Have a fabulous weekend! I’m off to peek around at all your other tasty goodness! I just blogged today that I don’t know what I was thinking not going to BlogHer. Kicking myself, hugely. 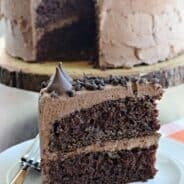 And I’ve been looking for a good (and easy) chocolate cake recipe. 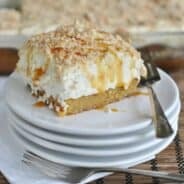 Do you love love love this recipe? I’ve seen some with melted choc vs. cocoa powder, butter vs. oil and there are just so many options! How gorgeous is this cake! I was very jealous of all the BlogHer posts as well. Maybe one year I’ll get there! Do the m&m’s have a raspberry flavor as well????? Up here in Canada we have nothing like that!!! But then again were a bit boring when it comes to food up here!!! Like Cherry Coke, they don’t sell it here anymore and havent in years. I have friends that go across the boarder just for that!!! I have just came across your blog not to long ago and love it!!!!! This looks fantastic. Cannot wait to try tCome and visit us on Friday. We are having a great giveaway. Flip flops that you will love. his one out. Delicious. Okay – this just looks toooooo awesome! Yummm! This cake is too much fun! And looks SO moist. I used dark chocolate chips (Ghirardelli). ENJOY! 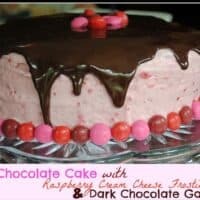 I love chocolate and raspberry – looks amazing! That looks amazing! 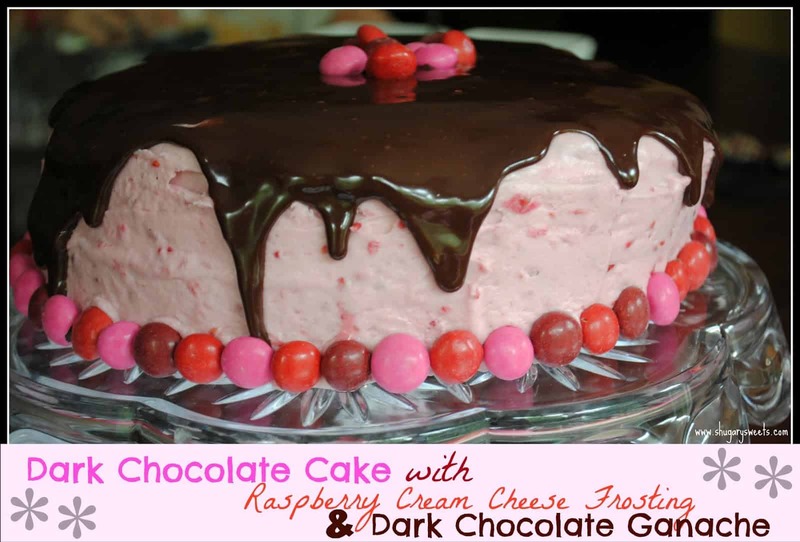 My husband’s favorite combo is dark chocolate and raspberry – I’ll have to give this a try! A couple of questions here. If I want to leave the coffee out of the cake batter, should I substitute something else? Also, in the frosting, can I use just liquid vanilla instead of the vanilla bean paste, and are frozen raspberries ok instead of fresh? As for the coffee, you can leave it out and just use water. The coffee only enhances the flavor of the chocolate (it doesn’t make it taste like coffee). But if you prefer you can just use water. As for the frosting, the vanilla bean paste has a much stronger vanilla flavor than plain extract. If possible use a combo of vanilla extract and the seeds of one vanilla bean. Otherwise you will lose some of that delicious vanilla flavoring. And as for frozen, I wouldn’t recommend it. The moisture in frozen raspberries will change the consistency of the frosting.